As gatekeeper of the Cambridge MBA, the prestigious program from Cambridge Judge Business School, it’s Conrad Chua’s job to pick the crème de la crème. And with average GMAT scores of 690 and seven years’ work experience, the CJBS’ MBA is consistently ranked among the world’s best. Each year diverse professionals from more than 40 nationalities join the experiential program. Emphasis is on assimilating the rigorous academic program with opportunities for students to apply their learning in various ways — including team projects, such as the Global Consulting Project with real, multinational clients. Among the employers engaging with CJBS MBAs are Amazon, Google, and Boston Consulting Group — the top three recruiters, says Conrad, who is head of both admissions and careers. But students are also flocking to and founding start-up companies, and benefit from engagement with the high-tech hub surrounding Cambridge. Cambridge University is an elite research institution that has produced at least 14 companies valued at $1 billion, including ARM, which is listed on Nasdaq and whose chips power iPhones. What does an ideal CJBS MBA candidate look like? There’s some basic factors everyone should have: strong academic ability, in addition to a good, solid track record of work experience. In addition, we look for people with strong global mind-sets who enjoy working with others who are different from themselves. We want people who are able to reflect, and who are able to take responsibility for their own actions. And who are strong individuals but also understand how they fit into a team. What backgrounds and experiences do you look for? People who’ve done well academically in top universities and in any field they’ve engaged in. We don’t have a certain preference. The usual suspects come from areas like finance, consulting, and industry, but we also accept people who’ve done well in arts management, sports, and who show a great passion for business. Do you prefer work experience or GMAT score? We would look at a candidate’s academic record and GMAT together, and then work experience. We also understand that in certain situations people might not have done well academically, but they’ve bounced back from that [in their careers]. If someone doesn’t do that well or is below our 690 average GMAT score, we then take a look at work experience, but they have to be exceptional. What are your thoughts on the GRE? We do accept the GRE. We are quite agnostic about whether someone uses the GMAT or GRE. What’s a typical mistake MBA applicants make during the application process? Sometimes applicants try to project what they think we want to see. And a lot of the time they try to project a perfect image, when actually what we look for is people who are able to reflect or are able to show they are resilient and are able to learn from their mistakes. We had one application essay entitled, What is your most spectacular failure, and what did you learn from it? The best applicants are those who think carefully about what major life experience changed them and how they bounced back from it. Those who don’t do well are those who try to downplay that failure. Which three sectors, and employers, are hiring the most at CJBS right now? E-commerce; technology, because there’s one or two rather big employers — Amazon and Google; and then consulting. [The biggest employers are] Amazon, Google, and BCG. What percentage of your MBAs are founding start-ups? Increasingly we see students start their own companies. About 15% of our MBA students start their own companies when they graduate. People now are beginning to think of entrepreneurship as a career choice. The UK in particular is becoming more welcoming of entrepreneurs. A number of our students take up the Tier 1 (Graduate Entrepreneur) visa. Cambridge itself is a great environment for people that want to start businesses. There’s the “Silicon Fen” cluster around Cambridge where you have many serial entrepreneurs and angel investors that people can tap into. The shift may also be a generational thing. This millennial generation are looking at much more flexible career paths — not just working at big corporates. They want that adventure that comes with founding a start-up. We do take entrepreneurs in the admissions process. Typically the ones we do take in tend to have worked on their companies for a fair amount of time. It does take time to build a business to a point where it becomes successful. For them it’s about thinking what’s the next step — how do we scale up? 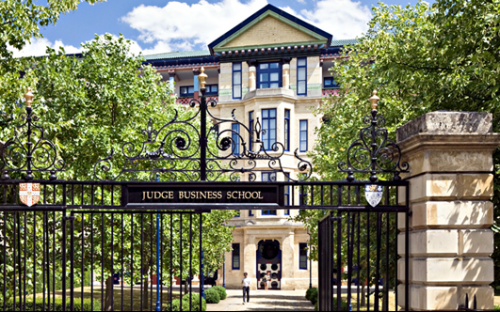 How does The CJBS MBA leverage Cambridge University’s strengths? I always tell my students it’s a great shame if they spend all of their time in the business school. All our students are members of colleges and many get to meet faculty and postgraduates or undergraduates from other departments. Through that they begin to expand their world view and sometimes make great connections — tapping into someone with a biotechnology or computer science background for example. How they leverage those connections is up to them — for example, do they start-up a new business? That’s quite vital now when I talk to many employers. And when they’re looking for the talent they will need five or ten years down the line, or even beyond, a lot are talking about talent that’s “digital ready” — people who understand the impact of digital technologies on business. This is the sort of thing we have incorporated into the MBA curriculum but being part of the university and talking to people doing cutting edge research — biotechnology, big data — you get an understanding of how digital trends will affect business.